There are three versions of PadJack RJ45 locks. All three versions, PadJack SVE, PadJack SV and PadJack LV, provide the same RJ45 locking functionality and each type offers organizations a different level of network security based on the purpose of the application. Does your organization protect mission critical data? Does your organization have public areas where network jacks are exposed, such as conference rooms, hospital rooms and lobbies? Does your organization have exposed jacks and open ports on the back of VoIP phones in unoccupied offices and hallways? Where: Data centers, government and military facilities or organizations who are at high risk of a security breach. 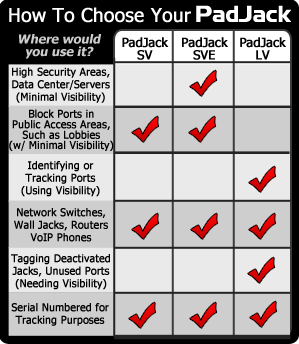 Purpose: Padjack SVE incorporates enhanced features developed by the National Security Agency (NSA) and provides the highest level of physical network security. It physically restricts and blocks access to the jack. If you are needing to block console ports on electronic devices, this is the ideal PadJack for you. Where: In public areas such as lobbies and conference rooms in hospital and medical facilities, banks, financial institutions and universities. Purpose: Easily secure and block access to exposed RJ45 ports, with minimal exposure. Purpose: Identify deactivated jacks throughout a facility, or unused ports on patch panels to avoid subsequent retesting. Where: USB ports on servers, routers, and computers. Purpose: To protect critical data that can be downloaded onto a thumb drive, portable hard drive or mobile device, and prevent viruses, malware, spyware and other malicious software from being uploaded from a USB device through an unprotected USB port. One Wire Loop Seal may be used to seal several adjacent USB Port Locks together. Where: Laptops and all single port USB devices. Purpose: To protect data from being downloaded, or malicious software from being uploaded through a USB port. Recommended for use where there may be a single open port, or where a Wire Loop Seal is not desired. Where: USB ports with attached cables in use on computers, servers, routers, or other equipment. Purpose: To prevent USB cables from being removed in order to gain access to USB ports and critical data. Where: Serial ports on computers, servers, and external devices. Purpose: Secures DB9 serial ports efficiently. Set includes screws and a Wire Loop Seal. DB9 Port Locks may also be used to block VGA ports. Depending on your organization’s purpose and application, there is a PadJack RJ45 lock that is right for you. PadJack RJ45 locks and USB Port Locks provide a cost effective, quick and easy solution to physical network security. All versions of PadJacks are easily installed by inserting the device into an unused port until it locks into place, with no special tools required. Copyright © 2019 PadJack Inc. All rights reserved.